There is a current vogue to focus on “core strength” and how important it is. And while I agree that the core is important, I’m not sure that strength is the most important part of it, and I’m not even sure that I agree with most people about where the core actually is. Some people consider the core to be the “abdomen,” with evidence of core strength in “six-pack abs.” These are often the same people who believe, as Robert Dover does, that one should ride from half-halt to half-halt and they’re so busy half-halting with their cores that their abdomens seldom come out of contraction. To my distaste, they will sometimes tell you to “go ahead, poke my stomach,” which makes me question their equestrian tact. I don’t consider the core to be the basic abdominal muscles — the transversus abdominis, the rectus abdominis, the internal obliques and the external obliques — and I consider balance to be as important to good riding as core strength. The core strength that is necessary is the core strength required to maintain the rider’s balance regardless of the horse’s motion. And while this often involves quite a lot of muscle strength, it lies behind the abdomen, in the iliopsoas (if you’re going to share that aloud, remember the “p” is silent). You won’t find your iliopsoas by poking yourself in the stomach. It’s right inside your center, supporting your spine and linking it to your thigh, trunk and pelvis (the same areas, coincidentally, that Steffen Peters defines as “the seat.”). As you learned from the video, or already knew, “iliopsoas” is actually two muscles — the iliacus and the psoas. They assist in stabilizing the spine. They take part in thigh abduction and rotation. And they’re responsible for hip flexion (if you ride dressage, you’ve heard all about how important your “hip flexors” are). The iliopsoas doesn’t do its job very well if it’s not flexible. I think we should be talking more about “core flexibility” than “core strength.” The fact of the matter is that flexibility is what enables our core to absorb the motion of the horse, rather than pure, rigid muscle strength. Think about how a weight lifter moves and then think about how a dancer moves. Which would you rather resemble when you’re on your horse? As for me, I want to dance. And I want my horse to dance with me. 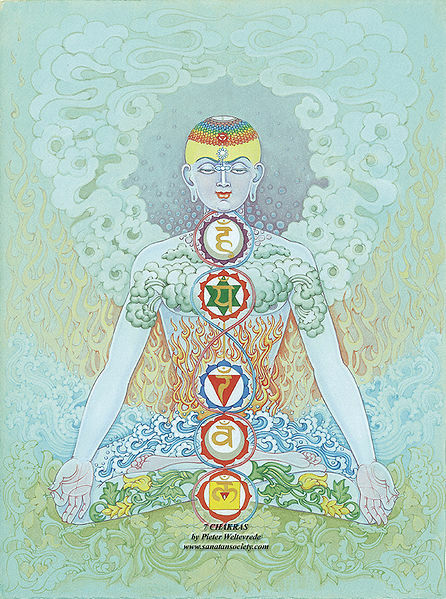 It is no wonder that the iliopsoas is the home of the second chakra, the “Svadhisthana.” In Sanskrit, this means “the dwelling place of the self.” It is also no accident that the emotion associated with this chakra is passion. As a person in love with the horse, it makes perfect sense to me that the iliopsoas would be home for the second chakra. Interestingly enough, your horse has his or her own iliopsoas, comprising the psoas major, the psoas minor and the iliacus. And it’s just as important in the horse as it is for us. 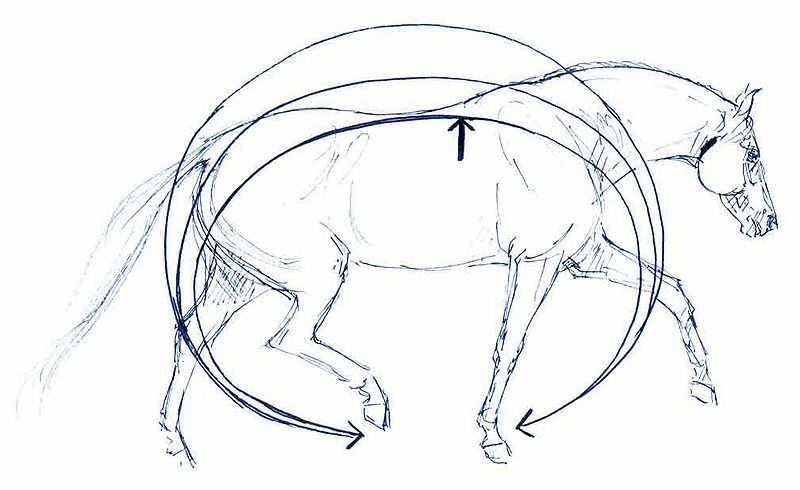 In the horse, it is responsible for stabilizing the vertebral column when the limb is fixed, rotating the limb outward, advancing the limb forward, flexing the hip and pelvis and inclining the pelvis to the side. Massage can target your iliopsoas and that of your horse (Jean Marie Denoix and Jean-Pierre Pailloux stress the importance of the psoas in their book, Physical Therapy and Massage for the Horse, which is a tremendous resource for information on horse maladies, even if it is less than useful as a manual for the novice equine masseuse). The practice of yoga can awaken and strengthen your iliopsoas, and the core exercises which I’ve mentioned before can do the same for your horse. I do yoga. I have also activated my iliopsoas, deeply and somewhat mysteriously, during Bowen Therapy. I wanted to share some of my favorite exercises for awakening and stretching the iliopsoas with you, but I haven’t written that book yet. I did go to youtube in hopes that I could find something for you, but there was nothing I could recommend. I do recommend exploring yoga or pilates, or bodywork that reaches the iliopsoas. I’ve been taking Alexander Technique lessons to try and stop my migraines. I’ve known for a few months now that it’s knots in my neck and shoulders causing them so I wanted to learn how to not get so knotted up. This post reminds me very much of what she’s been teaching me about posture. Also, she told me that when I’m doing crunches to not let my belly push out away from the floor- that’s using the wrong muscles. As you said, the real core muscles are too deep to feel on the outside. Fantastic. I hope AT works for you, Shannon. It’s great that you’re working with someone. I’ve also found Deborah Caplan’s AT book and tape very useful. Hi Shannon: Have you ever heard of a little book titled, ” Pain Free”? it’s author is Pete Egoscue. He runs a clinic ( the Egoscue Method Clinic) in San Diego and says a lot of pain is contributed to the body being out of balance. Everything else starts to compensate and the next thing you know your whole body is in pain. My farrier was at the point of quitting his job ( and that would have been criminal) and finding work that didn’t punish his body so much. An old friend from high school sent him the book. He started to do the excercises faithfully and the 4 compressed vetebrae in his back (on the verge of rupture) pulled back inside the discs and he is now pain free. If the AT stops working for you, you might want to give it a try. I’ve heard great things about Egoscue from another trainer up in Massachusetts, who is putting on clinics with an Egoscue practitioner. I didn’t know that there was an Egoscue book! Thanks Elaine.